Getting started playing hockey can be a bit overwhelming when you consider all the gear you need, but it helps if you can acquire it a little at a time. If you are only playing street hockey, purchasing gloves and shin guards are a good place to start. If you intend to play ice hockey, here is the list of all things to consider. To measure your hat size, get a string and wrap it around the crown of your head. Measure the total then divide by π (3.14) The result should be a number somewhere around seven. Most helmets are sold as small (under 7 ⅛) medium (7⅛ – 7¾) and large (above 7¾.) X sizes are often available if you don’t fit into the range. You have a few options when it comes to a face shield. You can go with a full metal cage, a full fiberglass sheild, a half shield that comes down to about the nose, or a shild/cage combo. The advantage of a full bar cage is that it offers the most protection, but some visibility is sacrificed. The disadvantage to a full glass cage is that it tends to fog up. The half visor offers the best visibility, but sacrifices protection. Disclaimer: A hollowed out watermelon is not recommended. These range from a basic $1 boil-and-bite to a $200 piece your dentist can custom make you. Either way, you will probably save compared to a hefty dental bill for damaged teeth. Not a lot of guys (myself included) wear these. A neckguard is basically a choker made of padded foam. While playing a game of roller hockey in high school, I witnessed one of the refs take a puck to the throat. He was very slow to get up, and probably wished he would have been wearing on of these. Not quite as heavy as plastic plated football pads, hockey shoulder pads are worn to protect against sticks, pucks, other players, smashing into the boards, etc. Even in a non-contact league they are probably still a good idea. Proper fitting elbow pads should cover all the area between where your gloves end and shoulder pads begin. In general, roller/street hockey elbow pads have a hard plastic shell, whereas ice hockey elbow pads tend to be constructed with a softer material. When buying gloves, they may seem huge if you are used to weight lifting gloves or batting gloves. Hockey gloves protect your hands from sticks and pucks. If you haven’t played a lot of hockey up to this point you would be surprised how much your hands will take a beating if you don’t wear gloves. Try to find gloves that don’t feel to tight while still offering a comfortable grip. You want to have a little bit of wiggle room, but not so much that your hands slide out. Most hockey pants include a place for a belt as well as small knobs on the side to be used with suspenders. These are not necessary, but for some players this offers the extra support they need. This is where it can get a little bit confusing, because ice hockey pants aren’t really pants, they are shorts with pads sewn into them. This is not to be confused with a girdle, which is basically just the raw padding. Girdles are either worn under a) roller hockey pants or b) a “shell” which look similar to roller hockey pants, but are the length of shorts. Players who need to switch the color of their pants will find the girdle + shell combo more convenient. 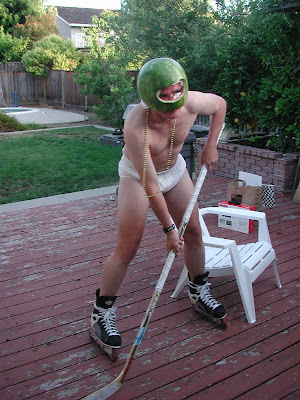 For those that play ice hockey recreationally, pants are usually the best bet. As far as length, some players favor pants that land above the knee, while others prefer them to fall below. It’s just a matter of preference. This is what holds your cup. They come in different styles: mesh shorts, compression shorts, solitary strap, and more. I highly suggest finding something that fits well and is the most comfortable. This is not the place to settle for something that doesn’t fit quite right. These should cover the area from where your pants end your skate begins. I try to find shin guards with velcro inserts because they are easier to wash. Some guards are a little more dense than others, so try to match up the thickness of the shinguards in proportion to how hard players in your league hit. You also might want to look for shin guards that wrap around to the calves, having the extra coverage can be a plus. Socks are worn over the shin guards to help increase the friction when sliding on the ice, as well as for cosmetic purposes. Although they are called socks, they are more like leg warmers because they are open on both ends. Socks can easily slide down if not held in place by a jock or garter. Another option is simply to tape them using non-friction shinguard tape. Roller hockey players don’t need to worry about socks if they are wearing full length pants. The three main types of sticks to choose from are: wood, aluminum, and composite. Wood sticks have been around the longest and are the best choice for kids and beginners. They are the cheapest and absorb passes well. The fibers in a wood stick will wear quickly if a player shoots hard and flexes it a lot. Most new players, however, won’t notice a difference. Aluminum sticks were popular in the 90’s because at that time composites weren’t really on the scene and made sense to have a separate blade and shaft; making it possible to replace blades as they broke, rather than the entire stick. It also opened the door to experimenting with different blade patterns. Aluminum sticks aren’t widely used now because they are heavy and not very flexible. Composite sticks consist of fiberglass, graphite, kevlar, and other materials. Cheap composites are made up mostly of fiberglass resulting in a heavier stick with a more “ping”. They are also more susceptible to breakage. A nice graphite based stick can last a long time, even years depending on the player. These sticks are light and strong and can be accurately labeled with a precise flex rating. The downside is that they are expensive!–usually starting at around $100. Before you buy your first expensive stick be sure to read our three part series covering stick flex, stick length, and blade patterns. You can’t play hockey without skates! Since there is a lot to say on this subject, it deserves its own article. This entry was posted on on March 9, 2010 at on March 9, 2010 and is filed under equipment. You can follow any responses to this entry through the RSS 2.0 feed. You can leave a response, or trackback from your own site. Thanks for your comment on my blog. I don't normally say this (because I only say it when it is true) but your site is awesome. I had fun reading each post, they were very informative and also fun to read. usuaully it is one or the other, but not both. You have a great writing style, keep it up. This could be the beginning of a great online bloglationship. I think I just made that word up!